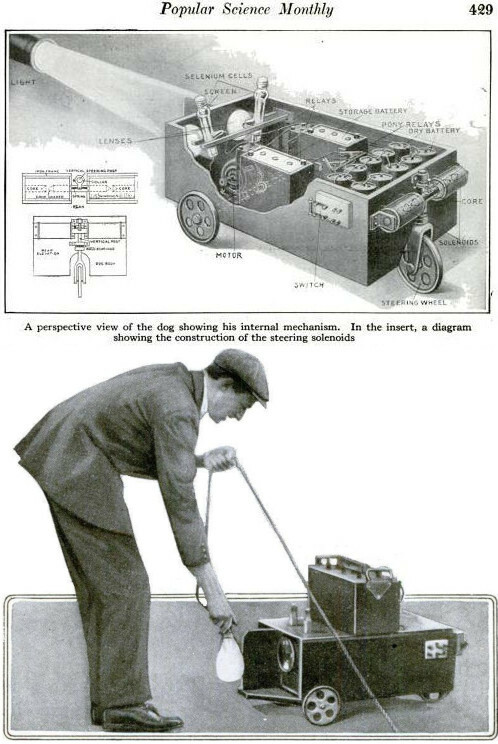 Electric Dog, the ancestor of all photo-tropic self-directing robots, was designed in 1912 by two young American experts in radio-controlled devices: John Hays Hammond Jr. (1888-1965) and Benjamin Franklin Miessner (1890–1976). 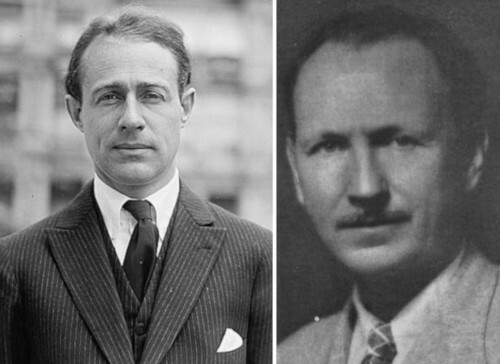 In fact Hammond initiated and funded the development, while Miessner refined the design and built the device, and later borrowed it from Hammond and popularized it (in several articles between 1915 and 1919, and in the book Radiodynamics: The Wireless Control of Torpedoes and Other Mechanisms, Miessner, 1916, see an excerpt from the book, presenting Electric Dog). The Electric Dog itself was not patented, but certainly the technology was in terms of light guided missiles/torpedoes. Young Scientist Predicts Marvelous Results from Experiments With Selenium— Points to "Electric Dog" as Example of Its Possibilities. Well, naturally, after all this voyage into the land of miracles, one is too thrilled and dazed to know how to begin writing a story in a conservative, unenthusiastic way. Yet this story must be told, for it concerns some extraordinary experiments with the element, selenium, which are taking place right under our noses in America today, and about which, in spite of their vast significance, only a few scientists know anything at all as yet. Let's begin at the beginning, with Selenium. "It's one of the elements,'' Miessner explained. "It comes in bluish-gray slicks which look like sealing wax; and it costs about $3 an ounce. "Selenium has the peculiar property of changing its electrical resistance when influenced by light. That's the simple secret of all the weird things that scientists are doing with it." Miessner is only twenty-five year's old now, a graduate of the Huntingburg (Ind.) high school, and of Uncle Sam's navy. After serving three years in the radio-telegraphic department of the navy, he worked for two years with John Hays Hammond, Jr., at the interesting job of steering deserted ships all over Gloucester harbor from a wireless station on shore. Now Miessner is studying for a degree at Purdue university—and incidentally telling his learned professors a few things about radio-telegraphy and electrical engineering which they never heard before. 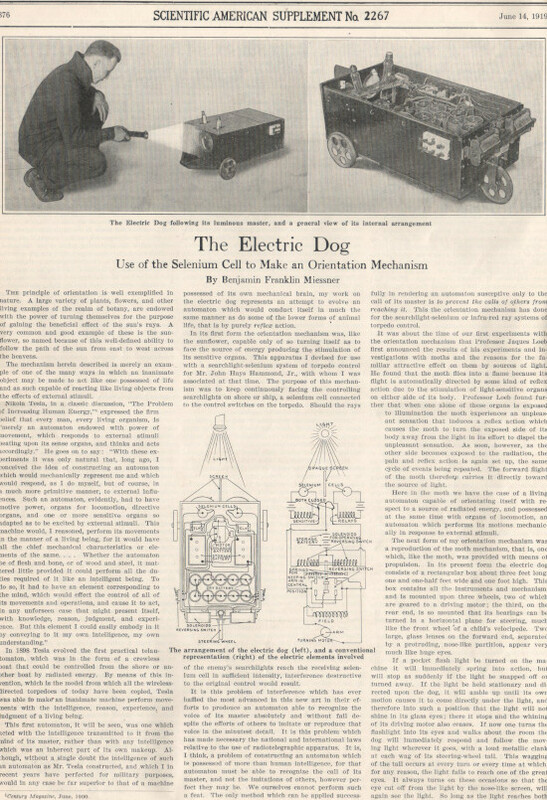 To illustrate his experiments, Miessner called his electric dog. From an electric flash he threw a bright light in the dog's goggly eyes, and the strange object at once ambled obediently out toward his master. Wherever Miessner went, about the room with that light, he dog patiently followed, as inexoribly compelled as the moth by the flame. "The electric dog has two cells of selenium, one behind each of those glass eyes," explained Miessner. "When I throw the light upon him, if it falls upon either eye it reduces the electrical resistance of the selenium, as I explained before and and an electrical current is allowed to pass through, starting the motor which turns the dog's wheels. He begins to advance. But if the light comes from the right, say, it hits only the right eye, because of the projecting screen between the eyes, then the current passes through that, eye, only and not through the other. An arrangement of batteries and electro-magnets then pulls the little rear wheel to the right and that turns the dog straight towards light, whereupon it shines in the other eye also, and the current passing through this eye charges an electro-magnet which pulls the little wheel, or rudder straight again. So you understand whenever the dog sees a light, he simply has to go. "Now, we can make our electric dog over into a 'dog of war.' By simply readjusting the mechanism, the two selenium, eyes can be made to pursue a dark object amid light surroundings. Supposing a torpedo fitted with such apparatus were launched from shore on a bright day toward an attacking fleet. The battleships would stand up as the only dark objects against the bright sky and the torpedo would head straight for them with infallible and inescapable precision. "A change in the mechanism makes it possible to drive your electric dog, or torpedo, or Zeppelin, away from "you by prodding it behind with a search–light, instead of pulling it toward you." Miessner threw over a switch on his electric dog, and then when he flashed the light on the bulging eyes, the dog promptly, almost fearfully, backed away. The marvelous see-at-a-distance projects of which Miessner talks, are based also on the ligut sensitivity of selenium, the "magic eye." The apparatus consists roughly of a great "compound eye," composed of some ten thousand selenium cells, each cell connected with a similarly situated glowlamp on the receiving apparatus. The selenium cells are unequally illuminated "by the light which falls on them from the objects within their range of vision, thus allowing currents of varying strength to pass through, they will light their respective glow-lamps in exact reproduction of the light and shadow of the objects before them. "By a somewhat similar apparatus photographs have actually been transmitted by wire from Monti-Carlo to Paris, and published in the papers." Miessner commented. The selenium thief-catcher invented by Miessner consists of a selenium cell with guns, bells, a camera and flash light. As soon as the light of the burglar's dark lantern hits the selenium eye the whole array of noise makers goes off in one grand hubub. The thing's practical, because Miessner tried it out before a meeting of the Electric club in Chicago, recently, and nearly frightened the club out of its wits, besides taking a very good photograph of himself.